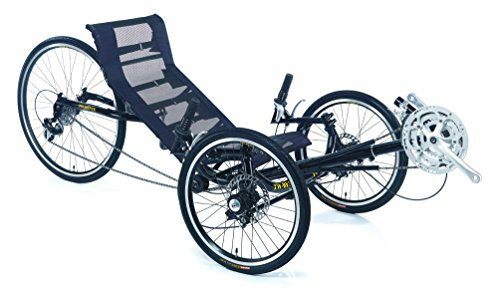 View More In Recumbent Bikes. The 2017 TW-Bents Trident features a 100% 4130 chromoly frame. The construction quality is outstanding, welding, paint, fit and finish and component choice is equal to trike costing much much more. There are a number of new features on the new TW-Bents Trident models. First is the folding frame so the trike can be easily transported or made smaller for storage. The chain is managed by teflon chain tubes and a few lengths of flexible rubber tubing. In less than a minute you can easily fold or unfold your trike. The TW-Bents handling is very smooth, light and responsive. There is no brake steer, and no pedal steer. The Trident handles very well with only one hand on the bars even at higher speeds. Trike handling just doesn't get more dialed that what is offered on the Trident. The Trident comfortable cockpit doesn't take anything away from its smooth ride either. The seat pretty much disappears beneath you which is pretty much what you want in a seat. The Trident bottom bracket isn't obnoxiously high either. The handlebars are widely adjustable also so dialing those in shouldn't be an issue. All of the components worked well together on the Trident. The Tw-Bents crank comes with 30-42-52 chainrings and the cassette is a SRAM 11-32 tooth 8 speed cassette.Giving the rider a nice baud range of gears to choose from. The Tw-Bent Trident is one of the best valued trikes on the market, couple that with one of the best rides and you have a trike that is hard to beat.